What characters from Chip 'n Dale Rescue Rangers are we attracted to? Gadget Hackwrench is the cute and beautiful child prodigy daughter of a famous mouse inventor and scientist named Geegaw Hackwrench. She has the uncanny ability to take a few odd-ball objects and invent nearly anything with them. Like most wacky inventor-types she can be extremely focused and, therefore usually oblivious of what is happening around her while inventing. 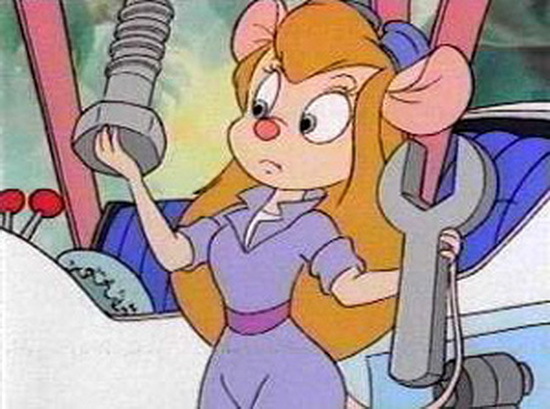 Gadget's personality was based upon the inventive female character Jordan in the 1985 movie "Real Genius". She's a combination of the "cute girl next door" combined with an obsessed and quirky inventor.